When The Nature Conservancy applied for a partnership that would include funding and assistance with public awareness of its reef forestation project, McCoy said Save The Bays was very impressed. 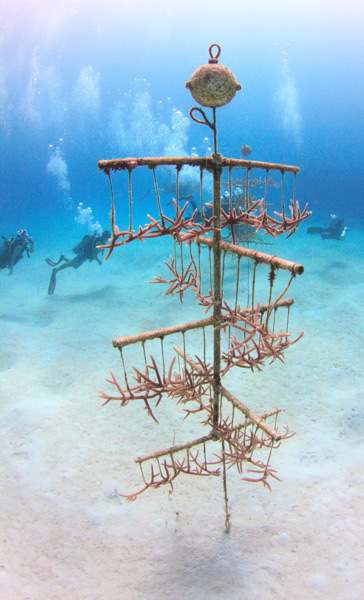 “The scope of the project – planting coral trees and immature forests of coral along the southwest coast of New Providence and in Andros and out planting to other restoration sites which will increase coral cover in the country, has great potential not only for The Bahamas but eventually for wherever reefs in the region are threatened,” she noted. “This was about action and they had the equivalent of a business plan with every detail accounted for.” Funding was announced nearly one year ago and the project launched. And less than a year later, results are so promising that Save The Bays renewed its support. Although there was a 15% mortality rate off New Providence, the rate was much lower, 2%, in Andros. 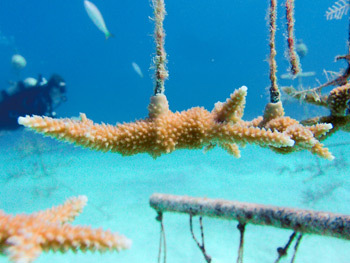 Scientists are also measuring connectivity and diversity within the coral nurseries. The community partnership grant helped fund the purchase of a boat used to place coral propagation units and monitor their development. It also helped in the production of brochures and information to share with other scientists as well as to the lay public, including visitors who dive or snorkel on the sites filled with promise. Stuart Cove Dive, a long-standing marine environmental caretaker according to McCoy, provided free dockage for the vessel. 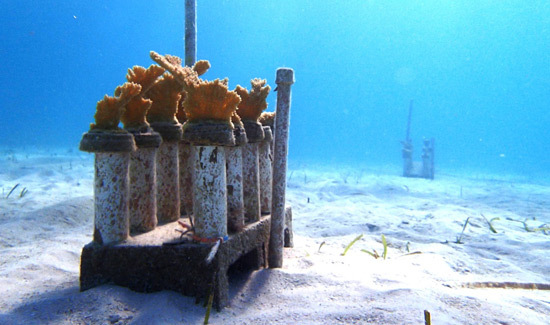 Next up with the new funding is expanding the coral nurseries in Andros and New Providence, bringing the total number of coral fragments to 10,000. Funds will also support training of volunteers and partners, and at the end of the year, perform genetic analysis of all donor coral. According to The Nature Conservancy, coral can grow up to 300% times faster in the nursery under optimum conditions than in the wild. Once it reaches a size where it can be outplanted, it is transported to a carefully selected reef that would benefit from the infusion of fresh coral, helping to build the reef’s resilientce to climate change and other factors. The Nature Conservancy already presented the findings of its initial program to a wide gathering of scientists, marine biologists, coastal engineers and environmentalists at a meeting in Corpus Christi, Texas, where the response to the program in The Bahamas was highly positive. Announcement of the renewal of the community partnership pledge coincided with Earth Day 2014. Information about Save The Bays is available on www.savethebays.bs and on its popular Facebook page with nearly 14,000 friends and fans. 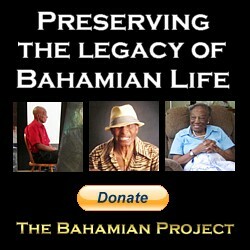 Information on The Nature Conservancy’s work is available through its Facebook page and blog.